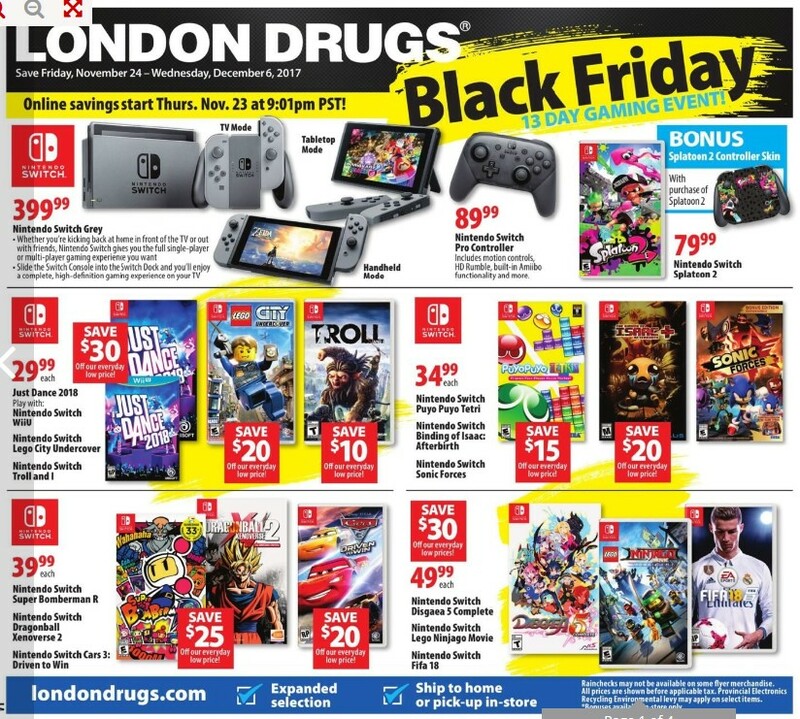 Nintendo Switch Lego City Undercover $29.99 Sale Price $20.00 Savings With two player co-op, friends can explore the sprawling open-world metropolis that is lego city. Nintendo Switch Troll and I $29.99 Sale Price $10.00 Savings Together, the unlikely friends embark on a journey through treacherous territory plagued with rivals. PlayStation VR Gran Turismo Sport Bundle $399.99 Sale Price $100.00 Savings Nov 23 - Dec 1. Uncharted: The Nathan Drake Collection The Last of Us: Remastered Bloodborne Until Dawn Ratchet & Clank $14.99 Sale Price I don't think uncharted needs any introduction. Thrustmaster T.Flight Hotas Flight Stick for PS4 $69.99 Sale Price $30.00 Savings Adjustable stick resistance. Compatible with PS4 and PCs. Thrustmaster T80 Racing Wheel for PS3/PS4 $99.99 Sale Price $30.00 Savings 2 on-wheel sequential digital gear shift paddles. Large optimized pedal set. Linear resistance. 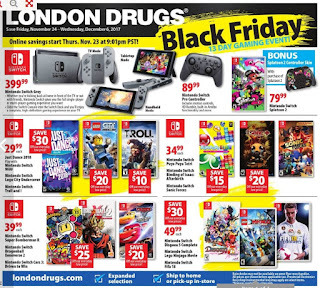 Find more London Drugs flyer such as PS4 Dishonored 2 - Death of the Outsider $24.99 Sale Price. Bethesda PS4 Fallout 4 $29.99 Sale Price $10.00 Savings Welcome to the next-generation of open-world gaming. PS4 Sniper Ghost Warrior 3 Limited Edition $24.99 Sale Price $25.00 Savings Go behind enemy lines with the ultimate modern military shooter. Call of Duty: Black Ops 3 PS4 $49.99 Sale Price $20.00 Savings A dark, gritty future where a new breed of black ops soldier emerges and the lines are blurred between our own humanity and the cutting-edge military robotics that define the future of combat.